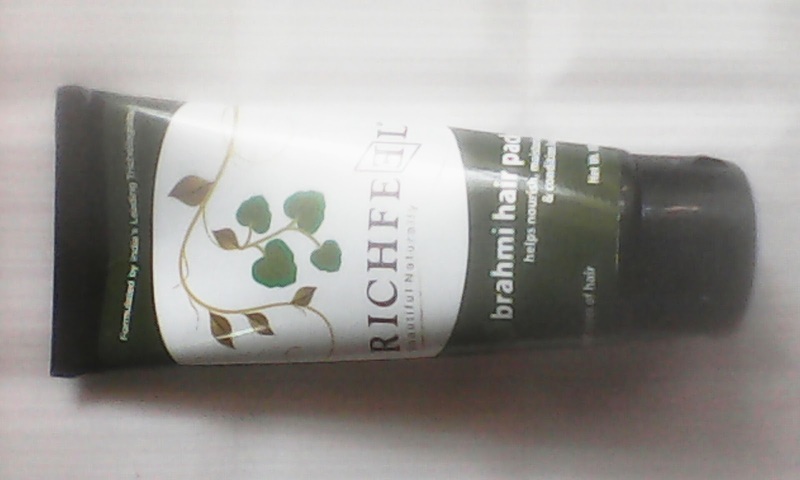 Product name:- Richfeel Brahmi Hair Pack. Packaging:- Richfeel Brahmi Hair Pack comes in a medium size black tube with white and bottle green label in it with all the details written. The tube has flip open cap to squeeze out the product from inside the tube. As the tube is medium in size and is quite handy and easy to carry on my vanity and thus it makes the product very much travel friendly. Product description:- Richfeel hair pack enriched with the goodness of Brahmi is a special formulation for dry, brittle & damaged hair. Brahmi is excellent for nourishing, conditioningthe hair & enhancing total hair health. Ingredients:- Brahmi Powder, Amla Powder, Kapoor Kachari Powder, Glycerine, Stearic Acid, Amodimethicone and Trideceth-12 centrimonium chloride, Light Liquid Paraffin, Glyceryl Stearate (and) PEG-100 Stearate, Preservatives, Purified Water-Qs. Directions for use:- After applying oil, apply pack on the hair shaft section by section. Leave it on for 20 minutes & then wash off with shampoo. For best results use once a week. My experience using Richfeel Brahmi Hair Pack:- The texture of the hair pack is thick and creamy. The colour of the hair pack is very much like light mudy colour with micro green particles in it, which is probably the brahmi and amla powder in it. The smell of the hair pack is strong and does smell like brahmi and amla, but is not at all unpleasant and goes after using a shampoo. The product claims to help nourish, moisturize and condition hair. Yes, it actually does what the product claims, once you use the hair pack, you will get nourished, moisturized and well conditioned hair. My hair type is dry and also because of using lot of hair styling tools, i ended up damaging my hair with whole lot of hairfall. Because the hair pack is specially formulated to treat dry, brittle and damaged, i used the hair pack after applying oil on my hair, as per the directions written to use the hair pack and covered my hair with a shower cap leaving it on hair for 20 minutes and washed my hair with shampoo but skip using conditioner on my hair to see the exact results. After air drying, my hair looked well nourished and well moisturized also the hair pack has deeply condition my hair and the big news is, it has literally lessen down the amount of hairfall I was having before. Though, it was directed to use the hair pack once in a week but because i was having a lot of hairfall, i used the hair pack twice a week and after using the hair pack my hairfall has decreased to an extent that can be noticed. Usually it is difficult to find products that suits everyone but happy to say that this hair pack is suitable for all types of hair. I do have sensitive skin but I don't have any irritation or itchyness, no allergies, no small bumps on my scalp after using this hair pack and thus i can say it is safe for use. I always support cruelty free products and this is one of those products that comes under the cruelty free zone. We all love products that are not heavy on our wallet, and this hair pack is going to be easy on your wallet giving you instant results, which is a sign of good product. Do, I recommend Richfeel Brahmi Hair Pack? Yes, i do recommend Richfeel Brahmi Hair Pack. Will, I repurchase Richfeel Brahmi Hair Pack? 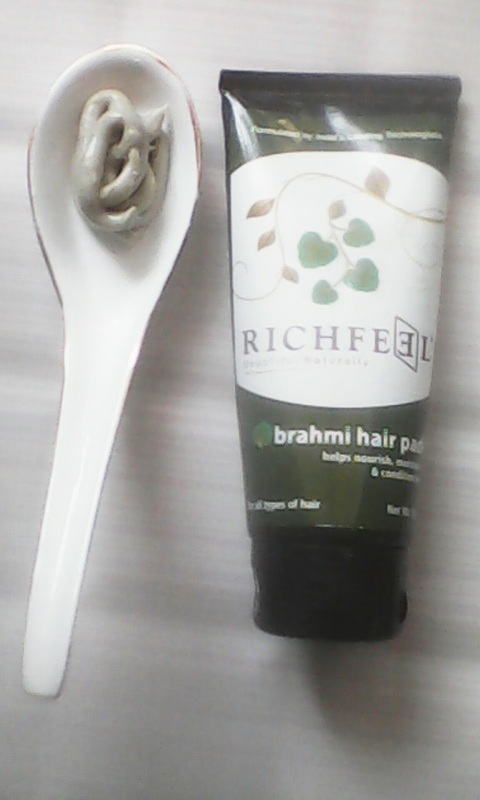 Yes, I will definetly repurchase Richfeel Brahmi Hair Pack. Keep it up... Doing good job farhaj. Love to see you reviewing more product. Sounds good, it seems an effective product. Very nice review. I've never heard of this line, but my hair could definitely benefit from this particular product because winter dries me out too! Thanks for the honest review! Inspires me to try it! I love the way this product allows you to repair dry, brittle hair. My hair has been a little odd with this pregnancy, so I'll have to check it out.